Wear your whitest running clothes and get ready to be showered with over 1,000 pounds of colored powder as you navigate the 5K (3.1 mile) course. After completing the course, the fun continues with a high energy finish line party at the County of Riverside sponsored "Healthy Living Extravaganza" equipped with live DJ entertainment, dancing, and group color throws which create millions of exciting color combinations! 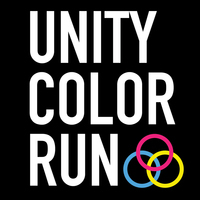 Each Unity Color Runner will receive a limited-edition commemorative race shirt, motivational wristband, a fun temporary tattoo, and a pair of sunglasses. Thursday & Friday April 25 & 26. Location TBD but it will be in Riverside. Please plan on arriving 60 minutes prior give yourself plenty of time to park, get your Unity Color Run swag, check in if needed, and to get situated. 8:00 a.m. Rancho Jurupa Park opens for parking, runner check-in, volunteer check-in, and on-site registration. 9:00 a.m. Unity 5k Color Run begins! After-party area is wheelchair accessible.